When delivery drivers cause accidents, vehicle operators, employers, and franchisors may be able to be held liable. 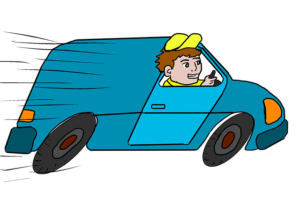 Delivery drivers who rush along on their routes making timed deliveries are a deadly hazard. Timed deliveries are more common than ever and it is unsurprising that the number of accidents involving speeding, distracted, or drowsy delivery drivers are on the rise. When these accidents occur, injured parties and their survivors may have multiple claims to pursue. Numerous factors can combine to create a deadly situation on the road. These include lack of driving experience, the pressure to meet delivery deadlines, and extensive time behind the wheel that leads to drowsiness. Most delivery drivers are young and inexperienced which is one reason that delivery drivers have some of the highest fatality rates of all professions in the United States. The employer can be liable if the driver is an employee of the company, such as a restaurant or grocery store. Injured parties may be able to pursue claims against the employer for negligent hiring practices, poor training, or negligent supervision. If the accident was caused by a vehicle defect and the employer owns the vehicle, the company can be held liable for failing to properly maintain the vehicle. It may also be possible to pursue claims against the franchise. Franchises can be held liable when their franchise agreement has a significant flaw that contributed to causing the accident. If a vehicle fault occurs or drivers are negligent in their driving habits, the courts have found franchises liable for failing to protect the public from harm. Many delivery drivers are contractors and not employees of the company. In these cases, injured parties and their survivors must pursue claims against the driver. However, few drivers have commercial insurance policies and their personal insurance policy won’t cover them if they are involved in an accident while conducting a delivery. When this happens, it may be possible to pursue claims against their employer’s insurance policy. As a final option, individual’s may have the ability to file a PIP or Uninsured/Underinsured motorist claim with their own insurance provider. This can help individuals recover compensation for the medical expenses and lost wages that occur as a result of the automobile accident.